A race of legendary, bioengineered warriors known as the Quo-Ti have long been the stuff of myth and legends. A topic of ancient lore for historians to explore and subject of horror stories told to the young children of a hundreds of civilizations for thousands of years. But the Quo-Ti are indeed real. Originally bioengineered by the great Ucharian Republic to help them confront their many powerful enemies back at the dawn of known history. The Tygernians, Empire of Froth, Gra-Nari Emporium, the Darks, the Old Ones; one and all, none could defeat the Quo-Ti. At least until the day the Quo-Ti Queen led her people in revolt against their Ucharian masters. The ensuing conflict nearly bought the Ucharian republic to its knees and led to the near extinction of the Quo-Ti as a race. Over a hundred thousand years have passed. The Quo-Ti, once exiled from the Milky Way and hunted across the Universe, have risen to dominance. They have multiplied and spread out among a dozen galaxies, gaining dominion wherever they go. Now a single Clan has led its people back to its origins and established itself along the outer rim of the Alpha Quadrant. Are any of the humanoid races safe? Will the long forgotten Ucharians resurface once more to confront their greatest nemesis? 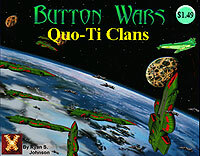 This 5 page PDF includes the spaceships, fighters and Pods belonging to the Quo-Ti Clans. Two pages of new ship special abilities, 1 page of full color spaceship playing pieces, and one page of fighter and Pod playing pieces. Button Wars: Tactical Spaceship Combat Game is required.